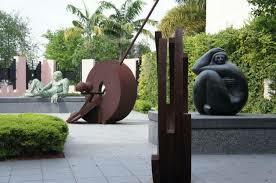 Directory of sculpture gardens around the world, by Benbow Bullock, sculptor. List of sculpture parks, Wikipedia entries. The vision was to create a special place where art, architecture and land came together. Artists and architects from all over the world were invited to visit Château la Coste and explore the beauty of the landscape. They were encouraged to choose a place in the domaine that spoke directly to them and were given the freedom to create something that would live there. The national organization for public art in Wales, with details of artists, projects, commissions and locations. In Welsh and English. Sculpture trail situated on the border between England and South Wales. Artparks Sculpture Park, Guernsey, U.K.
Artparks’ yearly Sculpture Exhibition physically displays between 150 and 250 pieces of sculpture, by around 90 different international and british sculptors, which are on display in the sub-tropical gardens of Sausmarez Manor in the form of a sculpture trail. 1150+ for sale sculpture are displayed on the website. Grounds for Sculpture, New Jersey, US. Jupiter Artland is a contemporary sculpture garden in the grounds of Bonnington House, outside Edinburgh, Scotland.Works by many leading artists have been commissioned and then constructed in situ, with the relationship of each artwork to its topographical location being a crucial feature. National Gallery of Art, Washington D.C. sculpture gardens. Park and organisation to promote marble sculpture in Thassos, Greece. In Lithuania, on a area of 55 hectares, a permanent exhibition of 90 artworks. Sculpture garden and museum in Denmark.